Home / Uncategorized / Who perceives our economic system as fair or not fair? Who perceives our economic system as fair or not fair? The Pew Research Center’s article Partisans are divided over the fairness of the U.S. economy – and why people are rich or poor by Amina Dunn (10/4/18) provides interesting results about perceptions of our economic system. Around six-in-ten U.S. adults (63%) say the nation’s economic system unfairly favors powerful interests, compared with a third (33%) who say it is generally fair to most Americans, according to a new Pew Research Center survey. While overall views on this question are little changed in recent years, the partisan divide has grown. 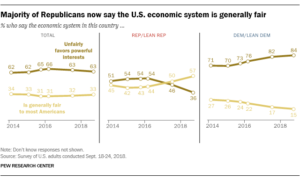 For the first time since the Center first asked the question in 2014, a clear majority of Republicans and Republican-leaning independents (57%) now say the economic system is generally fair to most Americans. As recently as the spring of 2016, a 54% majority of Republicans took the view that the economic system unfairly favors powerful interests. 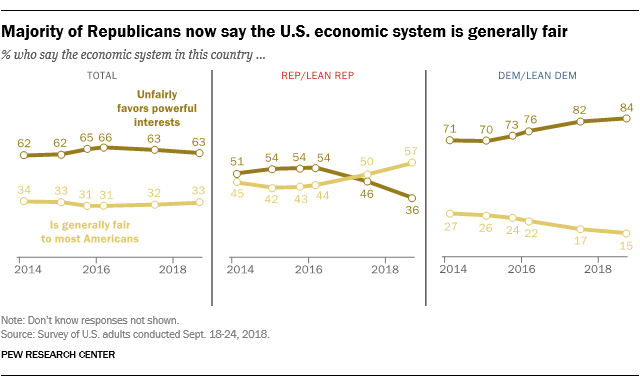 And while wide majorities of Democrats and Democratic leaners have long said that the U.S. economic system unfairly favors powerful interests, the share who say this has increased since 2016 – from 76% then to 84% today. The article lends itself to interesting questions. Why is there such a divide? Can both sides be correct or is the economic system either fair or not? A student project could focus on trying to answer the question of whether or not our economic system is fair. There are three other graphs in the article regarding the partisan divide on why people are rich or poor. 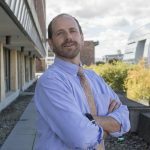 Previous How well do we understand rising sea levels? Next What is in the new IPCC report?